Preheat oven to 350°F. Spray a muffin tin with cooking spray. Press 1 slice of Canadian bacon into each muffin tin. It's okay if it breaks a little; it doesn't matter in the end. Crack one egg on top of each Canadian bacon slice. You could add salt and pepper here if you desired. Bake eggs for 12-15 minutes or until desired doneness. I like mine to be cooked but with a runny center and mine took about 13 minutes. 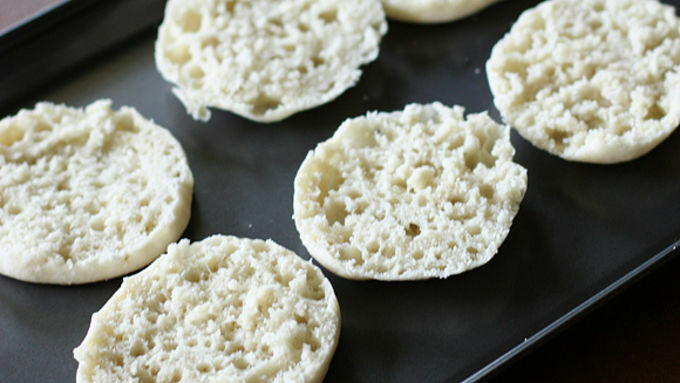 Place English muffin halves on a cookie sheet and brush with some butter if desired. Bake in the oven for about 6-8 minutes or until lightly toasted. I placed mine in the oven on the upper rack when my eggs were about halfway done so everything was done around the same time. While eggs are cooking prepare your Hollandaise sauce. For the sauce: Place the 3 egg yolks, mustard, lemon juice in the blender and blend together. Melt butter in a microwave safe bowl for about 1 minute. Butter should be hot and bubbly. Next, stream melted butter into the mixture slowly while blending until mixture is a pale yellow and completely combined. You can add a dash of hot sauce here if you like a little spice in your sauce. Hollandaise sauce should be made and served right away so that it is warm. Once eggs are done, pop them out with a spoon and place on top of a toasted muffin. Spoon Hollandaise sauce over each egg and serve. 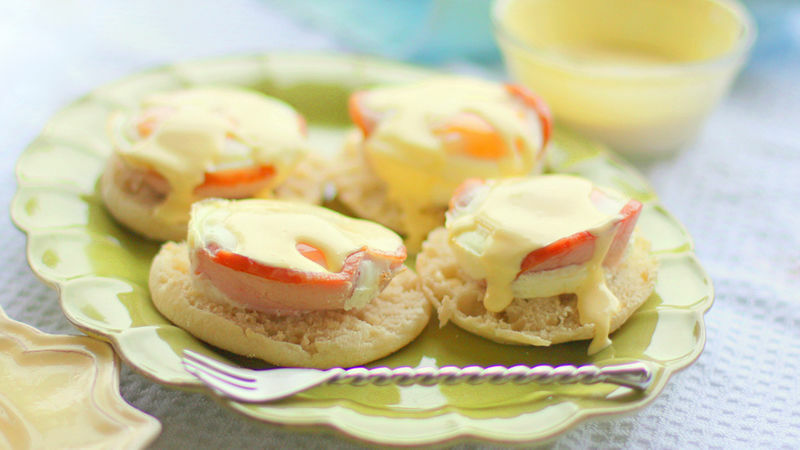 Super easy Eggs Benedict? Believe it! You can do this -- and it's super pretty, too! Eggs Benedict is one of those dishes that I would order at a restaurant but not necessarily make at home. It seems like it would be way too time consuming. Poaching eggs and making Hollandaise sauce is more effort than I’m usually up for in the morning. So I came up with some shortcuts to make this dish extra easy and unbelievably quick. 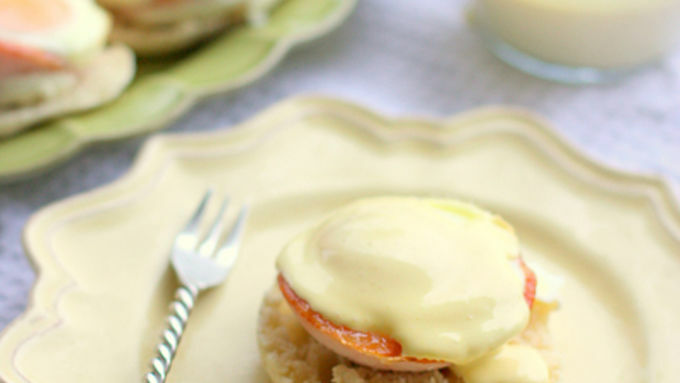 This simple Canadian Bacon-Cup Benedict has amazing flavor with half the work. Traditional Eggs Benedict calls for poached eggs. To be honest with you, I've never poached an egg in my life and I don't plan on starting now. 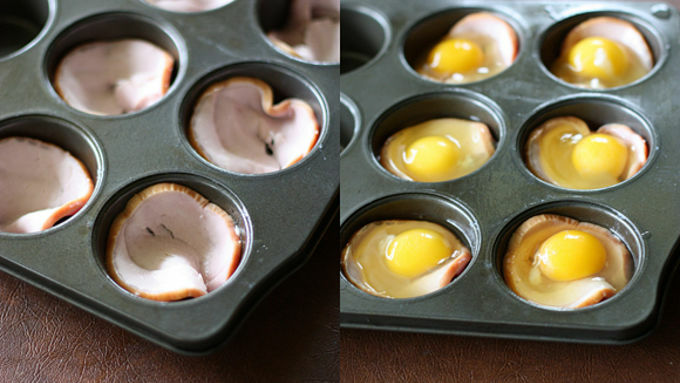 Baking eggs in muffin tins is a trick I've used before. 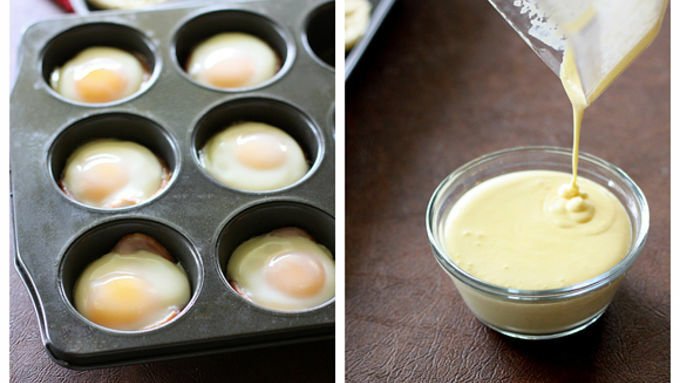 It makes for perfect eggs without hovering over a stove. I placed a slice of Canadian bacon in the bottom of each muffin tin, so not only did I have an egg "holder" but it heated up my bacon at the same time. The Hollandaise sauce for this recipe is very easy. Usually it requires whipping and beating on the stove top, but this sauce is made all in the blender. Pushing a button on the blender is as strenuous as it gets here, people. Hot butter and egg yolks are beaten into submission resulting in a creamy, heavenly sauce. Seriously, I almost started pouring it over everything in hand's reach. And just when you've finished your sauce, your eggs should be finished! Stick this one in your tried-and-true file because this one's a keeper! Check out the rest of our easy egg recipes for breezy mornings!